As a composer, Julia Wolfe draws inspiration from folk, classical, and rock genres, bringing a modern sensibility to each while simultaneously tearing down the walls between them. Her music is distinguished by an intense physicality that pushes performers to extremes and demands attention from audiences. 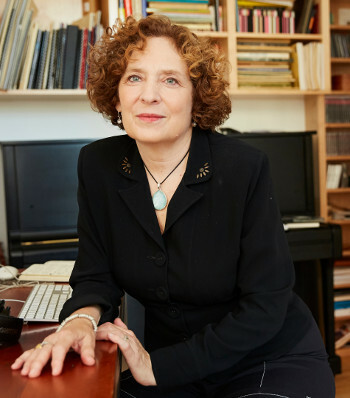 Wolfe came to composing when, as a freshman, she accidentally entered Jane Heirich's class at the University of Michigan, where she was enrolled in the liberal arts Residential College. While Wolfe grew up in a household of music lovers and played piano and folk guitar, this class, in which all music was presented without hierarchy, would be Wolfe's first formal composition training. She was drawn to the course and, eventually, the life calling, because she wanted to be a creator rather than an observer. The study of social sciences continues to interest Wolfe to this day, but composing gave her an opportunity to make something. Wolfe went on to study at Yale and Princeton universities, and is currently on the composition faculty at the Steinhardt School at New York University. Nearly 30 years ago she co-founded the music collective Bang on a Can with composers Michael Gordon and David Lang. The organization was so-named after Wolfe casually described what they wanted to achieve as 'a bunch of composers sitting around banging on cans.' Wolfe has collaborated with theater artist Anna Deveare Smith, choreographer Susan Marshall, designers Jeff Sugg and Jim Findlay, and director François Girard, among others. Her music has been heard at venues throughout the world, including Brooklyn Academy of Music, Lincoln Center, Carnegie Hall, the Sydney Olympic Arts Festival, LG Arts Center (South Korea), SettembreMusica (Italy), and Theatre de la Ville (France), and has been recorded on Cantaloupe Music, Teldec, Point/Universal, Sony Classical, and Argo/Decca. Wolfe's recently announced upcoming work is an evening-length piece for orchestra and women's choir. The piece will draw on oral history and archival materials to recreate the world of the women who worked in New York City's garment industry in the early 20th century. Scenic projection by Jeff Sugg will complement the text and music. The piece is a commission by the New York Philharmonic to be presented in its 2018-19 season. In the lead-up to the premiere, Wolfe will lead workshops at the New York Philharmonic's commissioning partners: Cal Performances at the University of California, Berkeley; the Krannert Center at the University of Illinois Urbana-Champaign, and the University Musical Society at the University of Michigan, Ann Arbor. Campus-wide discussions about history, music, and creative writing will be an important part of Wolfe's writing process. Wolfe has written a major body of work. Her string quartets, as described by The New Yorker, 'combine the violent forward drive of rock music with an aura of minimalist serenity [using] the four instruments as a big guitar, whipping psychedelic states of mind into frenzied and ecstatic climaxes.' Wolfe's Cruel Sister for string orchestra, inspired by a traditional English ballad, was commissioned by the Munich Chamber Orchestra and received its U.S. premiere at the Spoleto Festival. Fuel for string orchestra is a collaboration with filmmaker Bill Morrison, commissioned by Ensemble Resonanz. Wolfe's body concerto riSE and fLY, commissioned by the BBC and performed last season by the Cincinnati Symphony, features percussionist Colin Currie playing rapid-fire body slaps and street percussion. The influence of pop culture can be heard in many of Wolfe's works, including Lick and Believing for the Bang on a Can All-Stars. Lick, based on fragments of funk, has become a manifesto for the new generation of pop-influenced composers. The raucous my lips from speaking for six pianos was inspired by the opening riff of the Aretha Franklin tune Think. Wolfe's Dark Full Ride is an obsessive and relentless exploration of the drum set, beginning with an extended hi-hat spotlight. In LAD, Wolfe creates a kaleidoscopic landscape for nine bagpipes. Wolfe recently created the city-wide spectacle Travel Music with architects Diller Scofidio+Renfro in Bordeaux, France, filling the streets of the old city with 100 musicians walking and riding in pedicabs.